Hung out at the waterfront park then did some reading at the nearby Hastings-on-Hudson library, on one of the couches which offered a river view and AC! Got lunch at Antoinette's cafe, a haven for hipsters (or as hipster as you can get in Westchester), seniors, and everyone in between. Bought more organic soil for our garden at Sprainbrook Nursery. It was an interesting experience- very different from Home Depot, that's for sure! Hudson River Museum to see exhibit of Federico Uribe's Fantasy River, a magical critter-filled world made from repurposed materials. It was AMAZING! If you can make it to Yonkers by August 11, you must see it! Took a walk around Sleepy Hollow Cemetery. Got surprisingly yummy Indian food for take-away at Calcutta Wrap & Roll in Ardsley. It was one of the best Indian restaurants I've been to! Have you ever had fun in Hastings or a nearby Hudson river town? What did you do? Also, check out this NY Times article on how Hastings is becoming a hub for hipster breeders priced out of Brooklyn. It made us laugh a little. You're rocking those accessories, girl! And that bird necklace?? I LOVE! That belt with that t-shirt + skirt is just perfect too. I'm going to have to try and find one like that! Cute! I love that bird necklace! Thanks for visiting Kate Styled Pretty! thanks. yeah, i think your blog is so fun. looking forward to visiting again! Thanks Chandra! You have an awesome weekend. Hope you get to see the exhibit. Hastings was always one of my favorite weekend day trips when I lived in NY! Now I'm in DC, I miss Hastings and can't seem to find any place like it. You look oh so chic! Oh awesome! It's good to hear other people like Hastings too. I think it's pretty awesome. that yellow skirt is so cute!! love your blog! thanks so much! thanks for visiting :-) Come again! 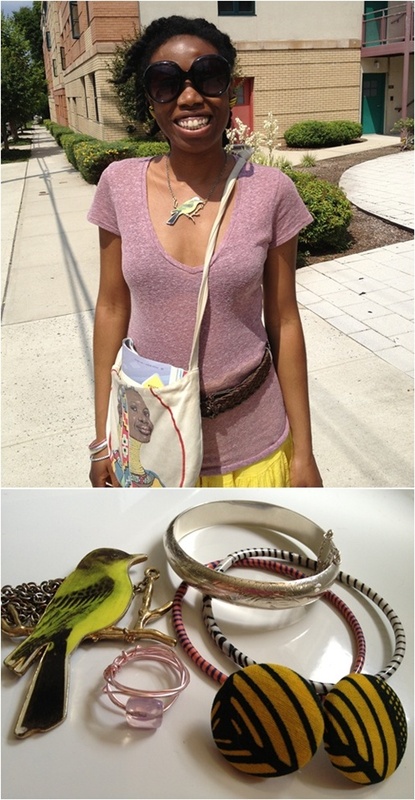 That bird necklace is gorgeous!! Love it with the bright yellow skirt! thanks Tiffany. Yeah, this bird necklace was quite the find. Best $4 I've spent at F21, I think.